The apartment has recently been renovated (2016), therefore everything is modern and new. The location is great! it's very close to Amsterdam Central Station, so it is very ease to get around the whole city from the apartment. The apartment itself is also great. The apartment is very bright and has a lot of natural light. There is a big living room, great bedroom and a modern bathroom. The living room is spacious and very comfortable with a great atmosphere. You can just sit down on the couch and relax while watching some television. There is a fully equipped kitchen. The bedroom is big and accommodated with two comfortable single beds where you really get to rest after a long day of sightseeing through Amsterdam. The bathroom is very modern and has a big shower where you can relax and fresh yourself up. 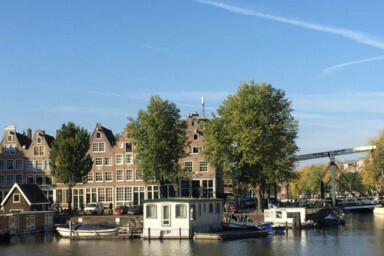 I am sure you will have a great time in this apartment during your stay in Amsterdam. Enjoy! You have access to the whole house with bedroom, bathroom and living room. You do not have to share this apartment with others. We will let you in, hand you the keys and show you around in the house as a basic introduction.. After that, you can always call if you need any assistance. We, Fokko and Loes, live upstairs; when we are home, we are happy to help and explain more about the city and the neighbourhood. The house can be found on Realeneiland, a small island that is part of the city centre of Amsterdam, but slightly hidden away from the rest. The realeneiland is part of a group of three islands that together are called 'The Western Isles' (Westelijke eilanden), the two other isles being Bickerseiland and Prinseneiland. The Western Isles are among the oldest areas of Amsterdam and have a rich history. The house itself is actually one of the fourteen original 'captain's houses' (kapiteinswoningen) of Realeneiland. The house carries the name 'In 't Anker', which translates as 'in the anchor'; the name along with the house's symbol can be seen on the gable. It can be found on the Zandhoek - the name for the street and corner of the island. As you walk around the neighbourhood you will see boats everywhere, as the island also functions as a small city harbour. A 15 minute walk from the house gets you to the Amsterdam Central Station. From there all of Amsterdam is easily reachable, by either tram, bus, metro, ferry, train or rental bike. Alternatively, the closest bus stops are the 'Westerdoksdijk' (bus 48), which is 3 minutes by foot and the 'Buiten Oranjestraat' (bus 18 and 22), which is a 10-minute walk. These busses can bring you to the Amsterdam Central Station or further to Amsterdam West or East. Tram 3 from Zoutkeetsgracht, a 4-minute walk, brings you directly to the Rijks Museum. If you come by, we advise you to have a look at 'P+R' (Park and Ride) for affordable parking. P+R-spots are easy accessible with public transport.